From left: Rightway Audio MD Danny Lau; Midas and Klark Teknik’s Sales and Marketing Director David Cooper; Rightway Audio Sales Manager Alan Wong. portfolio. 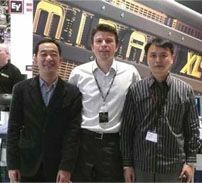 Midas and Klark Teknik have appointed Rightway Audio as their exclusive Chinese distributor, while Germanbased amplifier manufacturer Camco has also responded to the dynamic developments in the pro-audio marketplace in China with the appointment of Rightway Audio as its new and exclusive distributor in the territory. With headquarters on the Chinese mainland in Guangzhou as well as branches in Hong Kong, Beijing, and Shanghai, Rightway believes it is in a strong position to increase the brands’ market share in the region.